The Chinese might have dubious claims to having invented the game of football (of course they didn’t) but it seems that their national fruit can lay a more sensible claim to being the king of fruits. Pound for pound, this might be the greatest fruit of all time and munching a few should help you keep healthy for football, especially when you’re trying to avoid coughs and colds in the winter months. You might think that China has come up with some pretty impressive things in its time (the panda and that great big Wall of China, to name just two) but the kiwifruit might just have topped them all. You see, the kiwifruit that you see in the supermarket, the fuzzy type, is native to southern China. These ‘Chinese gooseberries’ began to be commercially planted in 1937 in New Zealand by the orchardist Jim MacLoughlin. The American servicemen in New Zealand during World War II apparently couldn’t get enough of them and so good old Mr MacLoughlin partnered with the New Zealand Fruit Federation in 1952 to market and export the fruit in the United States market. The fruit became popularly know as kiwifruit thanks to the New Zealand influence and has gone from there to now be enjoyed all over the world. 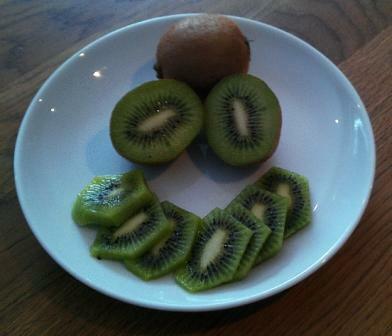 Although a relatively exotic fruit, all major supermarkets in the UK now stock kiwifruit all year round. It’s not grown commercially in the UK due to the unsuitable climate but several European countries grow it on a large scale and are the major suppliers of the UK supermarkets. The country growing the most Kiwi in 2010 according to wikipedia was Italy, followed by New Zealand, Chile, Greece and then France. Now here’s the important bit: there is twice as much vitamin C in kiwifruit as there are in oranges! 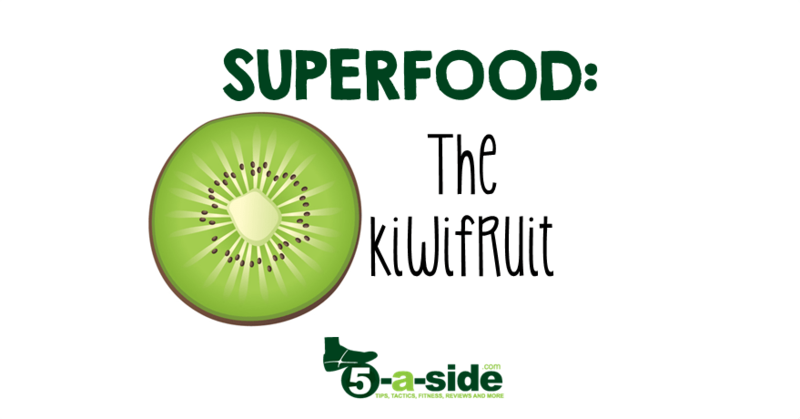 Just one kiwifruit can deliver your entire recommended daily intake of vitamin C. Vitamin C is important in keeping your cells healthy, is necessary for the maintenance of healthy connective tissue and helps wounds heal (so say the NHS)! It’s great in the winter at boosting the immune system and can keep coughs and colds away. Potassium – can be beneficial in the maintenance of blood pressure and for heart health. One kiwifruit contains about the same amount of potassium as a banana. All of these benefits come in a relatively small package making it a very competitive little fruit indeed. It has as much potassium as a banana with less calories and trumps the humble orange for vitamin C content. Praises be! To top it all off, kiwifruit are also fairly economical. 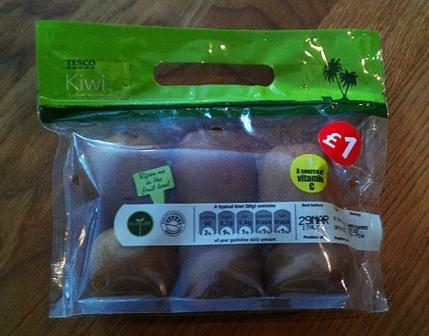 At the time of writing, Tesco were selling 6 kiwifruits for £1 so cost per fruit is well below that of an apple or an orange. Hopefully you’re sold on the wonders of the kiwifruit, in which case you can easily pack away one a day. These little fruits are so versatile that they can be served in a variety of ways: in fruit salads, smoothies or simply on their own. There is some debate over whether you should eat the skin. Many people enjoy eating the outer skin but others are put off by its furry texture. Whilst the skin may have additional benefits, especially in providing additional fiber, you have to weigh this up against the potential pesticide content if not properly washed, which might be undoing all of your extra health gains. The simplest way to eat a kiwi is to slice it in half as shown in the picture below and then simply use a spoon to eat the green inner and the seeds (it’s all edible). Doing it this way, you can enjoy a kiwifruit at your desk at work as a healthy snack instead of raiding the vending machine for crisps or chocolate! Cut it in half and scoop out with a spoon or peel and chop! In a smoothie (here’s a recipe likely to really impress) – little tip: why not peel, cut up and freeze several kiwis in one go so that you’ve got plenty of ammo for ice cold smoothies at all times. 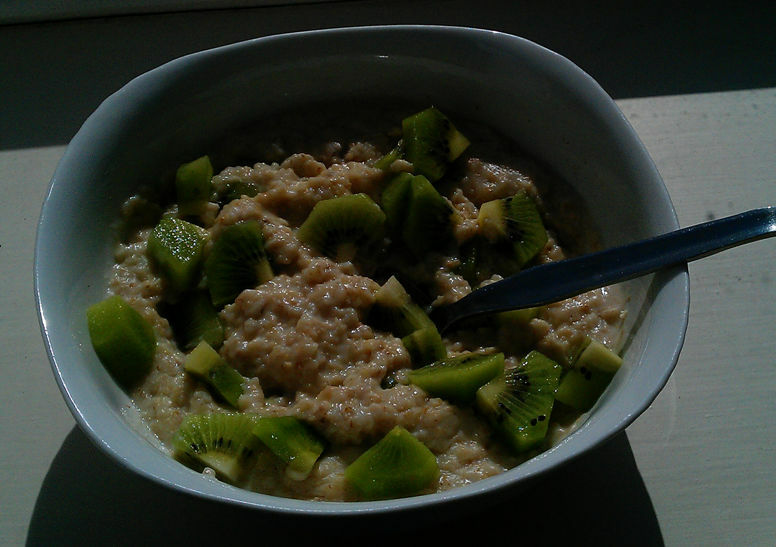 Supercharge your bowl of porridge with a Kiwifruit!